Proof that WTF Canada has a sense of humour! World Taekwondo Federation, that is. 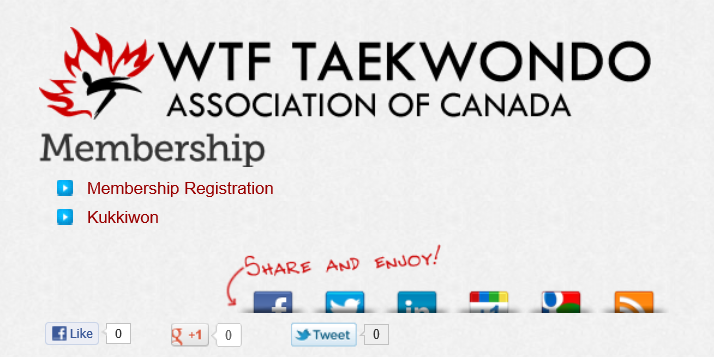 At the bottom of their membership page (http://www.wtfcanada.com/eng/membership/) they have links to join them on Facebook, Twitter, LinkedIn, and others… and over the logos for each site they have scrawled the words ‘Share and Enjoy!’. "Share and Enjoy" is, of course, the company motto of the hugely successful Sirius Cybernetics Corporation Complaints division, which now covers the major land masses of three medium sized planets and is the only part of the Corporation to have shown a consistent profit in recent years. The motto stands – or rather stood – in three mile high illuminated letters near the Complaints Department spaceport on Eadrax – "Share and Enjoy". Unfortunately its weight was such that shortly after it was erected, the ground beneath the letters caved in and they dropped for nearly half their length through the underground offices of many talented young complaints executives – now deceased. The protruding upper halves of the letters now appear, in the local language, to read "Go stick your head in a pig", and are no longer illuminated, except at times of special celebration. At these times of special celebration a choir of over two million robots sing the company song "Share and Enjoy". Unfortunately – again – another of the computing errors for which the company is justly famous means that the robot’s voices are exactly a flattened fifth out of tune and the result sounds something like this, only slightly worse. ← Just in time… Second Shot Exams Are Back! And that made my morning!